Propblur stainless steel etched propellors. Here is a really interesting item that is in development. It is called Propblur and is an intriguing method of simulating a rotating propeller. There have been a number of ways of doing this in the past and they run from having no blades at all to using a clear disc to actually installing a small electric motor to turn the prop. These all have their pluses and minuses. Obviously the most realistic is the motor idea, but often there is no room for the hardware. We now have an alternative. When one takes a photo of a spinning propeller, one gets a blurred propeller in the image. That is what is being duplicated with Propblur. 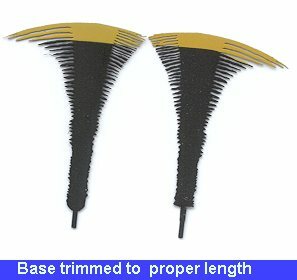 The blades in the review sample came as two to a fret and are for 1/48 scale. 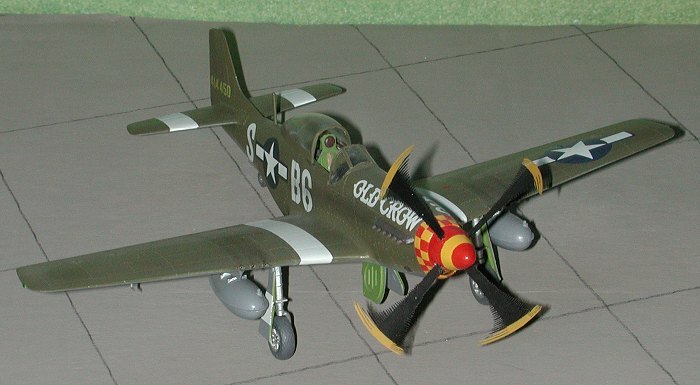 When I looked at them, I thought 'P-51 Mustang blades'. They are very well designed and should look the part when done. What I first did was to give them a sanding with 600 grit paper. This would be enough to slightly roughen up the surface to allow paint to stick. The blades were then painted flat black using Testors Model Master enamel. I would think that acrylics would not have the stick that enamels provide. They were then masked and the yellow tips painted. Measuring the blades to the ones on an old faithful kit on my display shelf showed that the etched ones were a bit longer than what stuck out from the hub. What I then did was to measure the difference between the two and trim the etched blades. This was not as easy as it sounds. 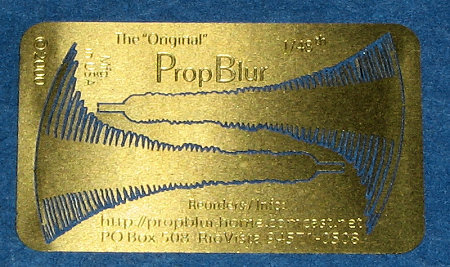 The Propblur samples weren't etched brass, but harder stainless steel and not at all easy to cut, even when getting it off the fret. The benefit of stainless steel is that it won't break nearly as easy as brass so can withstand a lot more handling. I've been told that production sets will be brass. Anyway, I trimmed the bottom of the blade, lengthening the stalk. You can also cut the bottom of the blade flush and then slot the spinner, but I wanted the more positive attachment that is offered by my method. I then clipped the old blades off the kit spinner and drilled holes in the stubs left over to accept the trimmed blades. The blades were then glued in place using an old Otaki kit that I'd built many, many years ago. I used superglue and accelerator to attach them. The end result is really quite convincing and adds life to the old kit. I am quite impressed with Propblur and should mention that they do provide these in other scales. Oh yes, I know that there should be a pilot in the plane. I used this old Otaki kit just to demonstrate how PropBlur looks. If you would like your product reviewed fairly and quickly , please contact me or see other details in the Product submissions page.